A cyclotron accelerates charged particles as shown in Figure 22.70. 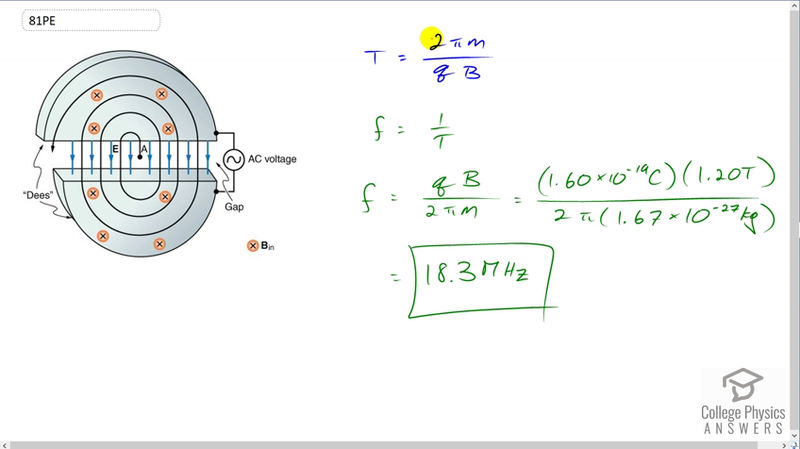 Using the results of the previous problem, calculate the frequency of the accelerating voltage needed for a proton in a 1.20-T field. Figure 22.70 Cyclotrons accelerate charged particles orbiting in a magnetic field by placing an AC voltage on the metal Dees, between which the particles move, so that energy is added twice each orbit. This is College Physics Answers with Shaun Dychko. The previous question has a formula telling us what the period of orbit will be for a particle in the cyclotron, it will be 2 pi times its mass divided by the charge times the magnetic field strength of the cyclotron. Now frequency is the reciprocal of period and so we’ll take this to the power of negative one and say frequency is qB over 2 pi m. And that means it’s 1.6 times ten to the minus 19 coulomb, because that’s the charge on a proton, times 1.2 Tesla which we’re told in the question is the magnetic field strength, divided by two times pi times the mass of a proton, 1.67 times ten to the minus 27 kilograms, giving us 18.3 mega-Hertz is the frequency of this accelerating voltage.